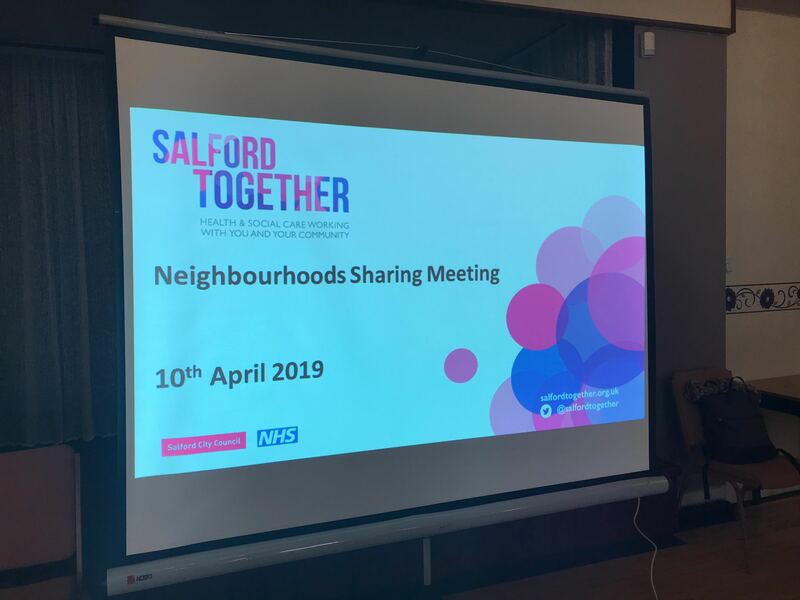 Welcome to the live event blog from the Salford Together Neighbourhood Teams event held on Wednesday 10th April at Elm Bank, Eccles. Follow us on Twitter and use the #salfordtogether to join the conversation. Salford Together’s ambition is to create local neighbourhood teams in the five areas of Salford – bringing services into the community. 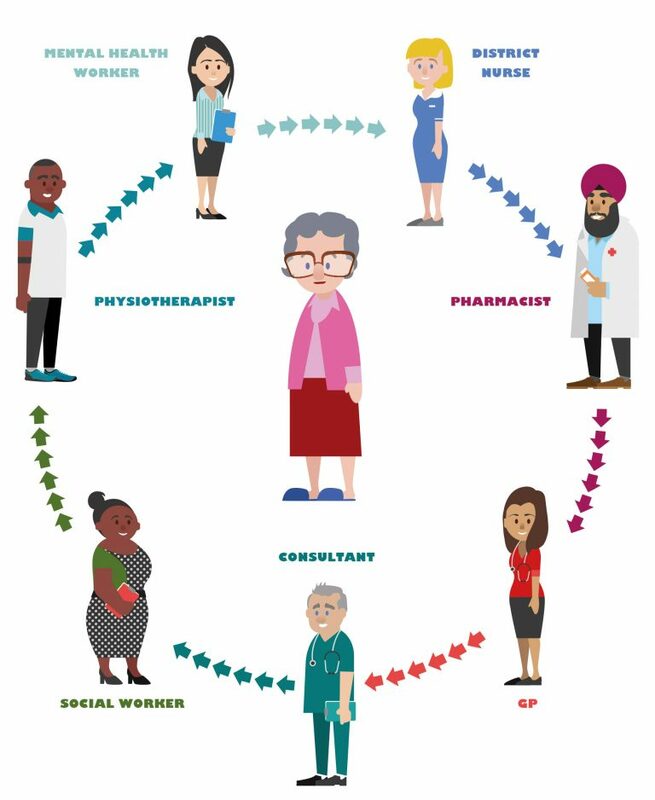 The neighbourhood teams are utilising a variety of different skills and working together to further develop integrated care in neighbourhoods. The day kicks off with a warm welcome and introduction from June Roberts and Mark Albiston. Mark highlights the importance of leadership to further develop integrated care within neighbourhoods to meet the needs and works for those living within the area. June explains the support that will be provided by AQuA to develop leaders, and the programme that is due to start in June 2019 to be at the leading edge for integrated care. June shares a lighthearted video and we take a few minutes to reflect on lessons in leadership. June then thanks the teams for their involvement in the work so far since January 2019. Helen Kilgannon then takes the floor to set out the days agenda, the outcomes for the day and deliver the first session in System Working and System Leadership. For the first activity, teams are asked to spend a few minutes selecting images from the tables that represents Neighbourhood working for them and share their thoughts with each other on what they’re hoping to get from the day. Helen highlights the importance of recognising systems working within healthcare, and the leadership role within this. Helen reiterates the various types of systems that exist and the uncertainty and unpredictedness of these systems working together. Over the years, leadership has therefore developed and transformed alongside the changing social systems. 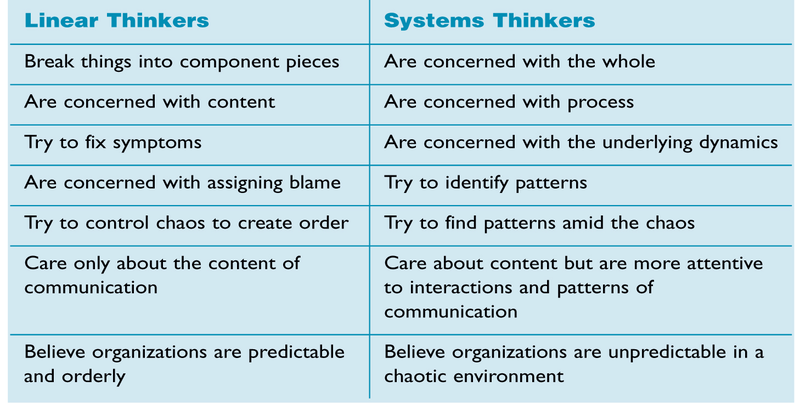 Given what we know about complexity and systems thinking, a different style of leadership is now needed to provide the most effective outcomes for the systems we are working in. 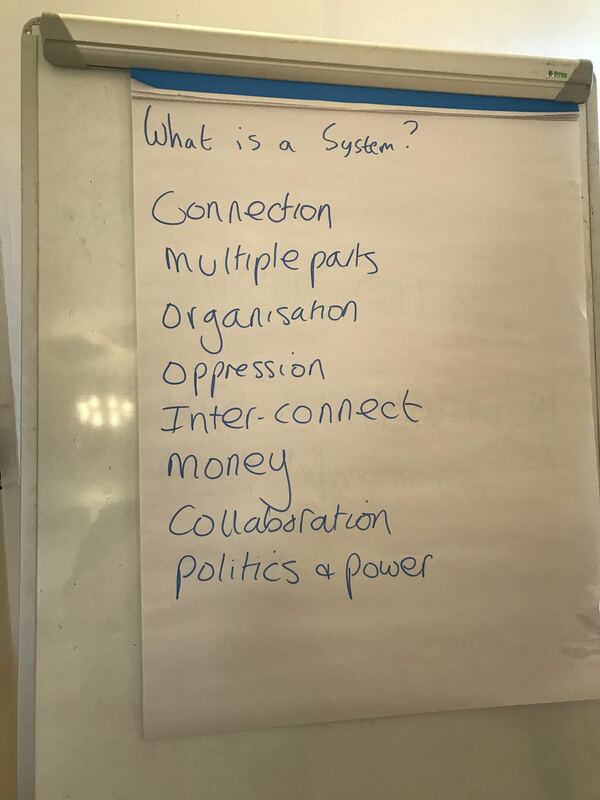 Systems work is about connecting the system to itself, making connections within the system to make it work, taking risks and learning about the systems to make changes. Julie Want then leads the teams through a set of activities focused around the first outcome for the day; agreeing our neighbourhood purpose. Within an active thinking environment, the teams are given time to think and everyone around the table is given equal time to speak about their thoughts. Julie tasks the teams to think individually about what their purpose is, and then collectively draft a purpose statement for the team. Time for a quick break now, before the room regroups to hear from Bruce Poole, VCSE Partnerships Lead. Back to session 3 and the focus is on working with VCSE and Wellbeing Matters. Bruce starts by talking us through the Salford CVS, the city-wide organisation providing support in the voluntary, community and social enterprise sector. Bruce then does a quick quiz to get those brains engaged again! Hands up if you volunteer or support within the community? – A few hands raised from the teams! 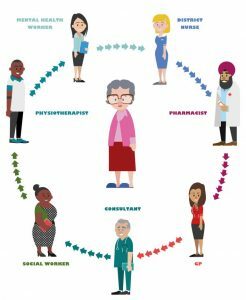 So how can the CVS help and support your neighbourhood team? Bruce and Wendy provide a link to the CVS network and can provide links to new community groups and can offer support for groups establishing within the neighbourhoods. The network can also offer training support,m information and guidance. Bruce goes on to explain the central role that Salford CVS plays in Salford Together, with each neighbourhood leadership group having a CVS representative to provide advice, support and engagement. Bruce hands over to Wendy now, to talk us through Wellbeing Matters and the delivery model. Taking us through an example, Wendy discusses the 3 main workstreams of the model, using a case study to bring the model to life. She discussed the outcomes expected from the model, for example improvement in health and improved relationships and the outcomes across the community and the wider system. Linking in to this, John Phillips talks us through anchor organisations that provide a broad range of activities and services. The room is back with Julie now for another activity, this time focused on what makes a good priority. Feedback from the activity reveals a range of priorities from each of the neighbourhoods, which will be focussed on at the next session. The final session of the day is led again by Helen, with a focus on System Visability. 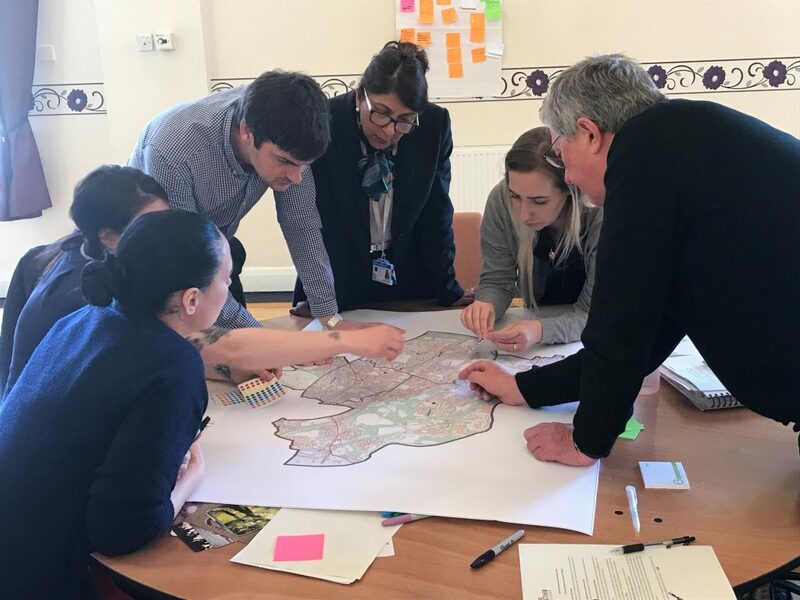 An interactive task to finish with, Helen has tasked teams with marking on maps where their communities congregate, for example primary care and large NHS buildings or services. To close the day, June takes us through the next steps for the teams and the programme. June reiterates the focus of today’s event; the focus on the core leadership team and starting to development the leadership for our neighbourhoods. Milestones for the programme are outlined, with a view to developing the priority project proposal by May 2019 and taking forward the priorities and leadership programme. June ends the day by reminding teams that the stories from within our neighbourhoods will be an important evaluation tool for measuring integration and thanks for room for attending.